Textkernel’s Apply-with Widget provides candidates with a one-click application experience while all relevant information is automatically stored in the structure of your database. Long forms scare off good candidates. To prevent this, Textkernel has developed the Apply-with Widget. Applicants now have the possibility to apply with just one click with the online profile of their choice (or any CV stored locally or in the cloud). All information contained in these documents will be processed automatically and saved as a structured candidate profile in your database. On the front end, the widget, which easily integrates with web pages or mobile applications, enables candidates to seamlessly apply for roles. They can upload their resume from a local folder or from a cloud storage service (Dropbox or Google Drive) or apply with a social media profile, such as LinkedIn, Xing or Viadeo. This contributes to a positive application experience. 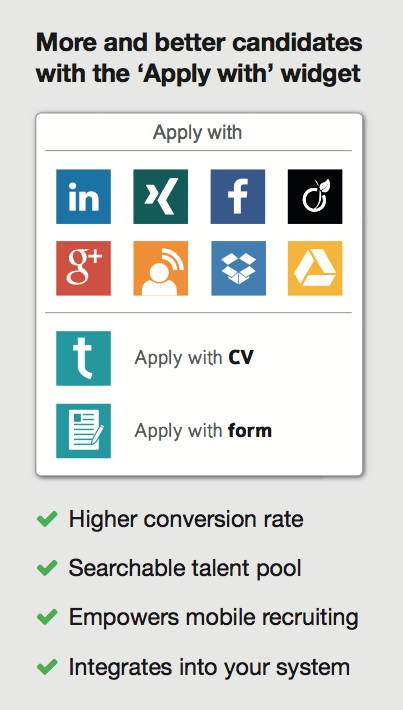 The Apply-with Widget not only improves the candidate experience, it also increases the conversion rate and allows for a more searchable database. On the back-end of the widget is Textkernel’s CV parsing (resume parsing) software that can extract and normalise data from any CV or profile. This data is then automatically stored into your database. This frictionless application process expands your talent pool and provides you with searchable information. Why use the Apply-with Widget? For more information about one click apply with Textkernel’s Apply-with widget, contact Textkernel.